Questions? Our team will be happy to help! 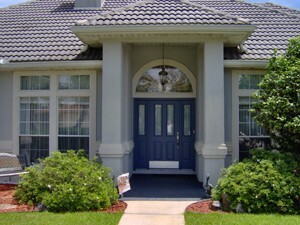 Majors Home Improvement is proud to install durable front doors for residences in the Pensacola, Florida, area. Did you know that your front door can help to improve your home’s energy efficiency? It’s true, and this is why our Majors Select™ Fiberglass Front Doors come equipped with a polyurethane core. This feature offers many times the insulation value of wood, so it helps to provide a buffer between your home and the weather, which can help to keep your home warmer in the winter and cooler in the summer. When you turn to Majors Home Improvement for entry doors in Pensacola, you’ll receive a professional installation from factory-trained technicians who will be respectful of your home and leave a clean jobsite at completion. Plus, we provide a warranty on our parts and labor, ensuring your investment is well-protected. What’s more, if you’ve been thinking about replacing the windows at your home, our installers will happily perform this project alongside your door replacement. This will significantly improve your home’s energy efficiency and curb appeal. To learn more about our front doors, contact Majors Home Improvement today. We are proud to serve homeowners in Pensacola and all surrounding communities of FL. Schedule a Consultation — Questions? Our team will be happy to help!